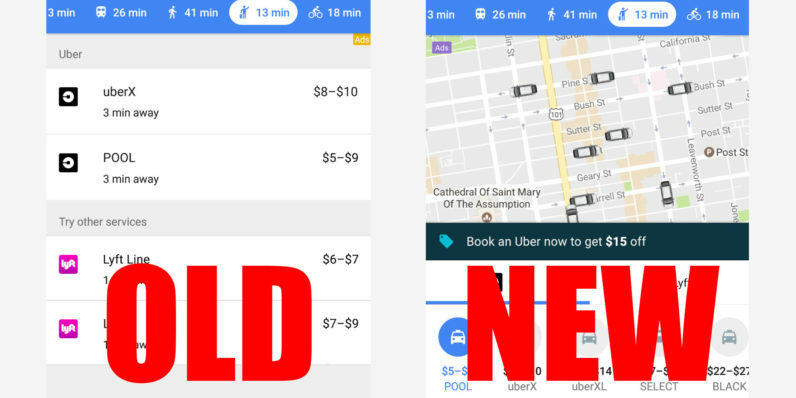 Google made everyone’s lives a bit easier when it added a taxi tab to maps for services like Uber and Lyft – though all it really did was provide a price estimate and link you to the respective app. Now Maps is getting a much more useful integration with ride services. Mainly, it will now show an actual map with local drivers in your area moving around in real-time. That should make it a bit easier to decide whether taking a cab is the best option for getting where you need. As shown in the bottom-right of the image above, you’ll also now be able to access the full breadth of ride options via carousel, instead of just the standard and carpool options (e.g. UberXL, UberBlack, etc.). The preview screen will also display special offers and promotions. Moreover, Google is testing even tighter integration with Uber, such that you never have to leave Maps (or even install the Uber app). Once you sign in with or create an Uber account, you’ll be able to see a map, track your driver, and communicate with them too. It actually has some advantages over the standard Uber app other than just convenience; Google will also show you information about your destination such as hours, menus, photos and more. The updates are rolling out to Android and iOS today.